Carlo Antoni, though highly underrated these days, was one amongst the (very) few Italian philosophers who, through and after WWII, endorsed liberalism as the political theory that better mirrored Western values and virtues. The article tries to sketch his journey as a scholar, a political philosopher and an intellectual, analysing his most peculiar views on historicism, individual liberty, natural rights and democracy. This study examines the relationship between Bruno Leoni and Italian political culture. Leoni’s liberalism was in many ways pioneering. Perhaps it is for this reason that he was not properly understood by Italian political culture, which was disconnected, for a long time, from some of the most innovative ideas of contemporary liberalism. But beyond the difficult relationship between Leoni and his country, there are interesting matters to analyse. On the one hand, there is Leoni’s analysis of the ideas of two of the main Italian liberals of his age, that is, Benedetto Croce and Luigi Einaudi. On the other, there is the influence exercised, on his own views, by two philosophers of law, Ermanno Angelo Cammarata and Widar Cesarini Sforza. This paper focuses on Lucio Colletti’s political and cultural experience. Intellectual by Crocean training, close to the Partito d’Azione, a highly critical militant in the Italian Communist Party until 1964, during the 1970s Colletti finally comes to democratic-liberal positions. However, his contribution to the democratic-liberal culture is not to be found in the writings on liberal authors in the last phase of his life, but rather in the theoretical criticism, developed in his previous years, to the foundations of Marxism and Leninism. Among these, are the attack to “dialectical materialism” by Engels, the study of the epistemological contradictions of Marx’s materialistic doctrine, the critic to the theory of the end of the state and politics (in which Colletti identifies the massive influence of Hegel’s philosophical categories on Marx’s doctrine), the criticism to Leninism for its denial of pluralism. The reference to nature and, consequently (from a doctrinal perspective), to natural law in philosophical and political debates was significantly recurrent in Italy throughout the last century. Legal positivism and its provocative theories placed into question a natural order that was traditionally considered immutable (wrongly, as Sergio Cotta taught), but that was still felt by many (especially at the level of common sense) as being just. The specific and preliminary philosophical duty (to which Cotta dedicated all his scholarly work) followed from subjecting, in its own analyses, the legitimacy of policy and of the positive law not to nature (and to natural law), but to critical assessment and to critical ontology. According to Cotta, law is significant not for the “bad man” (as Kelsen and Bobbio always thought), but for the man who seeks his own perfect fulfilment. The transpolitical interpretation of history offered by Augusto Del Noce in the twentieth century, giving priority to ideal causality [as genealogy of politics] over the materialistic theory elaborated by Marxism, has illustrated in an original manner the birth process of political ideologies in the age of secularization. But Del Noce also announced the end of ideologies – and here lies his particular merit. In his vision, especially Marxism has been a synthesis of both of these issues: dialectic and materialism, utopia and realism, which in performing themselves generated the decomposition of their own elements and failed regimes (Communism, Fascism, Consumerism, Nihilism). His hermeneutics of modernity is also important. It was aimed at challenging the interpretation of the Cartesian philosophy as the beginning of a process towards an absolute immanence. Del Noce considered the ‘Cartesian Cogito’ even giving birth to philosophy, based on the presence of infinity in human souls, which remains the necessary limitation to that power attempting to invade the human being’s sphere of action. He found in the idea of ‘Risorgimento’ the way to fight against the totalitarian and nihilistic results of the modernity. The Risorgimento intended as a philosophic and political category proposing eternal values (truth, freedom, equality, solidarity), pertaining to every epoch and culture regardless of different historical circumstances. Norberto Bobbio (1909-2004) has been one of the most important Italian political philosophers. In the second half of the twentieth century he also became a dominant figure among Italian intellectuals. For five consecutive decades, he place highly significant issues on the agenda, especially that of the left and of the Italian Communists. In the early 1950s, the issue was that of freedom with special reference to cultural freedom. In the 1960s, Bobbio the liberal-socialist invited the Communists to drop their own name and work for a unified left-wing party. In the early 1970s, he challenged them to solve the problem of the inexistence of a Marxist theory of the state. In the 1980s, the issue was democracy and its several unkept promises. In the 1990s, when the Italian left was in disarray, Bobbio wrote what quickly became his bestselling book, Right and Left, controversially identifying (the search for) equality as the distinctive trait of the left through time and space. Throughout, he was a frequent and much-quoted commentator in La Stampa, the daily of his home town, Torino, on political, social, cultural issues. Widely acclaimed by centre-left Italian public opinion, in a highly politically polarized Italy, he was criticized as much by several sectors of the centre-right. While his influence has inevitably declined after his death, there is no doubt that he deserves to be recognized as a highly esteemed intellectual (without recognizable successors of a similar stand). Gianfranco Miglio was one of the most original Italian political theorists of the last century. Consistently applying the criteria of ‘political realism’, he outlined, on the one hand, a ‘pure’ theory of politics and, on the other, proposed a series of constitutional reforms in order to promote “a better Republic for the Italian people”. 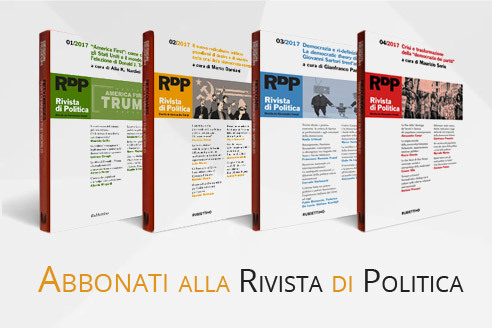 Miglio – a political scientist who very competently mastered also the tools of the history of political thought and of ancient and modern political institutions – was convinced that the Italian state was born replicating all the ‘inconsistencies’ typical of the ‘modern’ state organisation of power. To these had added the ‘contradictions’ typical of a unification that historically resembled “a technical miracle of ‘reason of State’”. The article highlights the main cornerstones of the constitutional proposals which, in Miglio’s opinion, were the essential conditions for a stable and representative political system as well as a society not entirely subject to politics – a neo-federalism based on economically and socially homogeneous macro-regions, the overcoming of ‘integral’ parliamentarianism, greater powers of decision to the government. 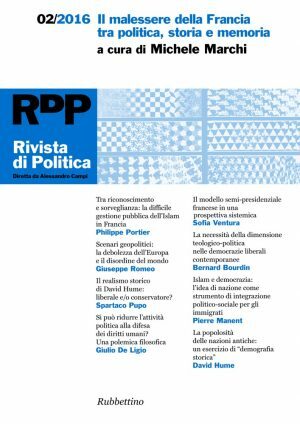 Because in Italy clientelism and personal relations prevail over the respect of impersonal rules, the more a new Constitution will reflect the reality of a country that is a “Mediterranean Republic”, the better it will be. Miglio’s proposals, judged too heterodox or even eccentric by other scholars, were criticised and opposed especially after the early 1990s, when he became Senator of the Lega Nord (Northern League) and began to be considered as some sort of ideologist for the secession of the North from the rest of Italy. These proposals stemmed, on the contrary, from studies conducted by Gianfranco Miglio throughout his academic career. At their heart was the awareness that only the design of new political institutions can be an appropriate response to the decline of the modern state, and that only a “Hanseatic-style federalism” will be able to ensure for Europe some non-precarious form of integration. Nicola Matteucci was an historian of political thought and a political philosopher. 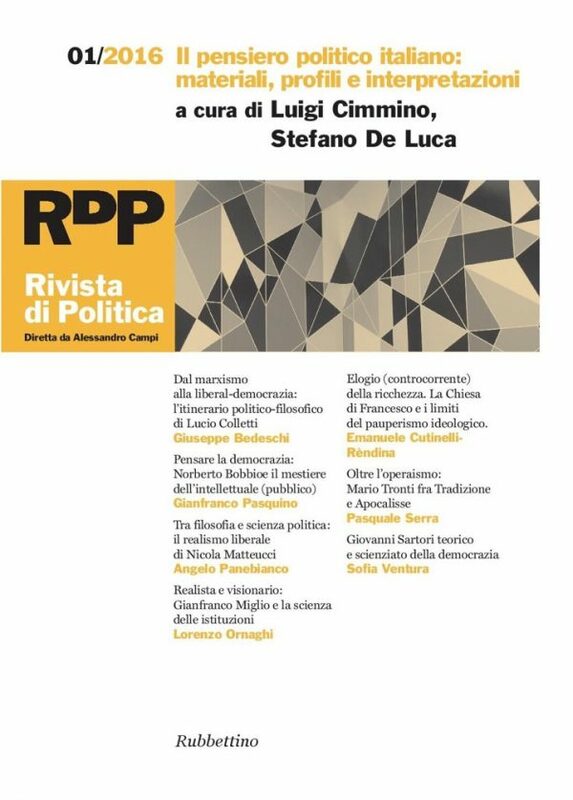 This intellectual portrait describes his complex vision of politics and his strong contribution to the renewal of the liberal studies in Italy. Mario Stoppino (1935-2001) was for thirty years Professor of Political Science at the University of Pavia. His intellectual activity was centred around the endeavour of providing political science with a general conceptual framework able to direct empirical research. Strongly influenced by the Italian Elitist School and by the Chicago School, he developed an original version of the power approach to politics. The results of his efforts are summarised in three main works: Potere politico e stato (Political Power and the State), Milan, 1968; Potere e teoria politica (Power and Political Theory), first ed. Genoa 1982, third amended and enlarged ed. Milan, 2001; Potere ed élites politiche (Power and Political Elites), Milan, 2000. The article aims at reconstructing the main aspects of Stoppino’s theoretical work. His approach to politics is subdivided into two phases. In the first, Stoppino adhered to a conception of political power defined, in the Weberian perspective, in terms of the monopoly of violence, and provided an account of the set of constraints surrounding the power of government (the “political structure”), and the forms of action that political power stimulates (the “political process”). In the second phase, Stoppino developed a conception of political action defined as the search for guaranteed power (i.e. power stabilised over time and generalised over space), which allowed him to reformulate his central theoretical assumptions and to redefine the concept of political power itself. In his later definition, political power is guaranteed power in the form of political authority that in turn produces guaranteed power in the form of rights distributed among the members of the political community. 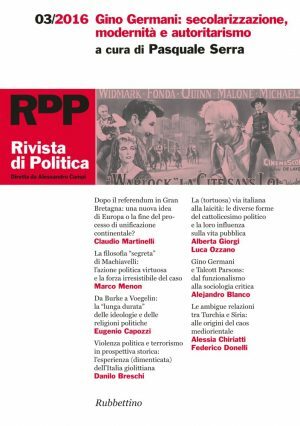 In the present essay we intend to delineate an uniform description of Mario Tronti’s political philosophy, whose essential theoretical nucleus can be tracked in an original philosophy of freedom and in the configuration of a complex relationship between tradition and freedom. The author conveys an integral historic interpretation of the traditional image of Tronti as “operaist” because the privilege assigned to workers and Capital’s philosophy can lead to an incomplete understanding of the complexity of Tronti’s philosophy. Instead, the reflection is here conducted through a rescue of Tronti’s pre-operaist philosophy and the mature philosophy developed starting from the early 1960s. This interpretative choice allows for a comprehension of the specificity of Tronti’s thought, especially if compared to the second operaism to which the author is often grouped and interpreted. Giovanni Sartori can be considered the founding father of Italian political science. Influenced by the behaviourist revolution of the 1950s and 1960s, he developed an original approach that also reveals his philosophical background and his particular attitude towards logical reasoning. 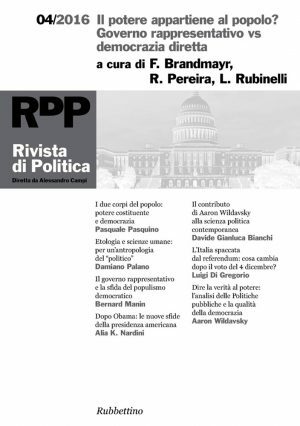 Thanks to this approach and to his systemic view of political phenomena, he has given a fundamental contribution to comparative politics and political theory as well, not only within the Italian scientific context, but also in the international one. The article reconstructs the role played by Sartori in the development of Italian political science and focuses on his conceptualization of the nature, instruments and goals of such discipline. Finally, it analyses how his rich and complex approach achieves and offers an in-depth understanding of democracy and democratic regimes, both from the perspective of political theory and that of comparative politics.